I'm sorry, but is this not the cutest dress?! 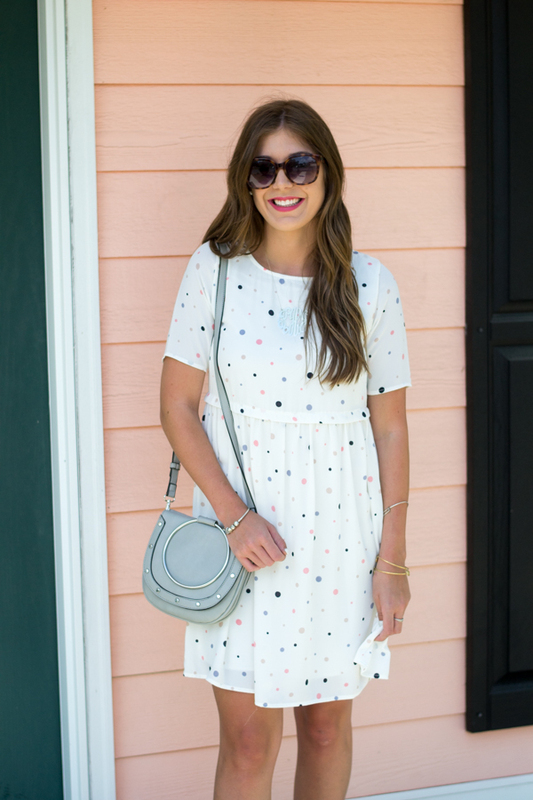 I don't think I own anything else that is polka dot, but this dress is definitely here to stay! 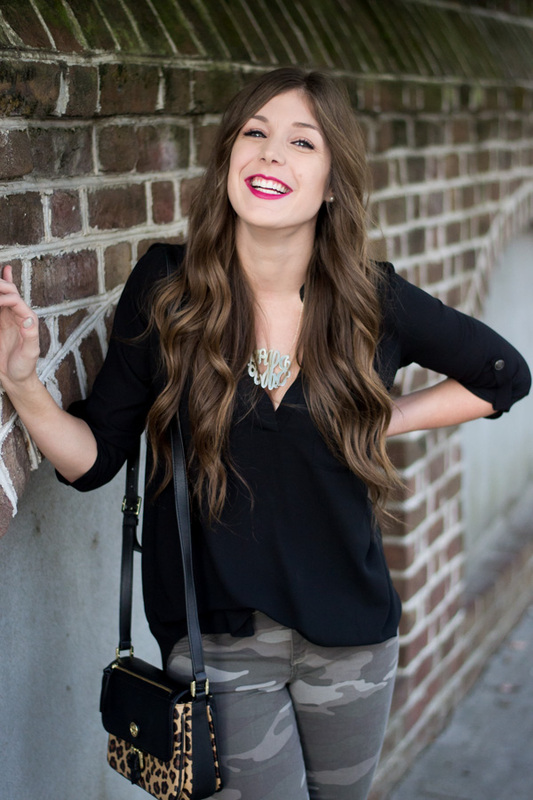 If y'all have never heard of Shop Stevie, you definitely need to check them out! They have the cutest selection of clothing with some of the best prints! 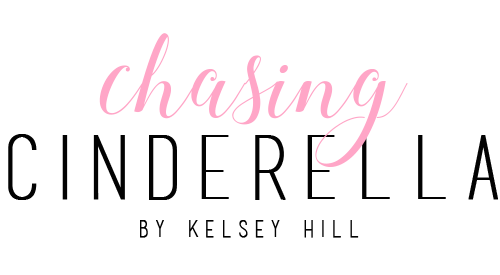 And lucky for you, you can take 15% off at checkout by using my discount code CHASINGCINDERELLA. I am also so excited to share this purse with you!! It is under $30 and doesn't it look just like the Chloé bag?! I couldn't believe it when my girl Gretchen from Living Life Pretty showed it to me, I obviously had to buy it right on the spot! It also comes in a blush color! This really is the cutest dress! I love it. It looks so good on you! That dress is so stinking sweet! I love the different shades of the polka dots. And hello cutest cross body ever?! Love it! ah such a cute dress! The polka dots are just subtle enough so that they don't overtake the dress! I love that little polka dot dress! Too cute on you! That polka dot dress is so cute! And that bag is such a good dupe! I love your monogrammed necklace! It's so pretty and classic. What a totally cute dress! Love polka dots! such a fun dress... but that BAG!!!!!! So cute! And that bag is such a good dupe! Love this dress on you! That bag is gorgeous! That dress really is adorable. Love how you styled it! And this dress will be mine! 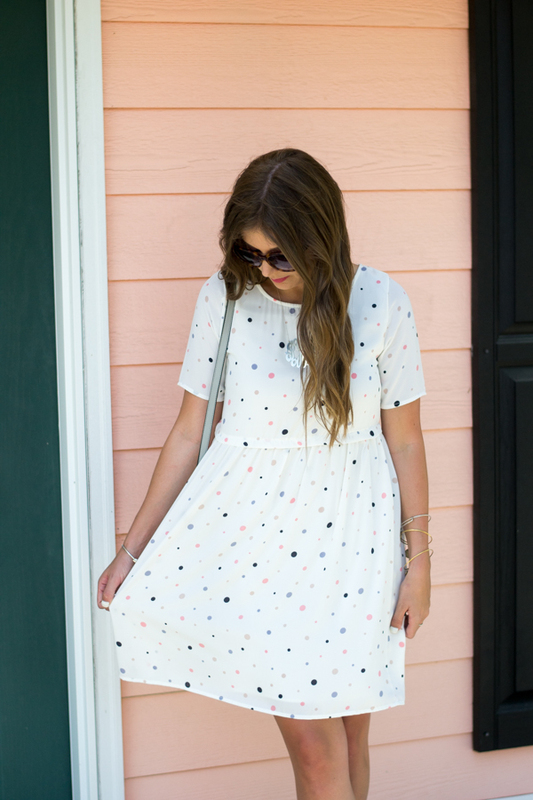 It is one of the best polka dot dresses I have seen! 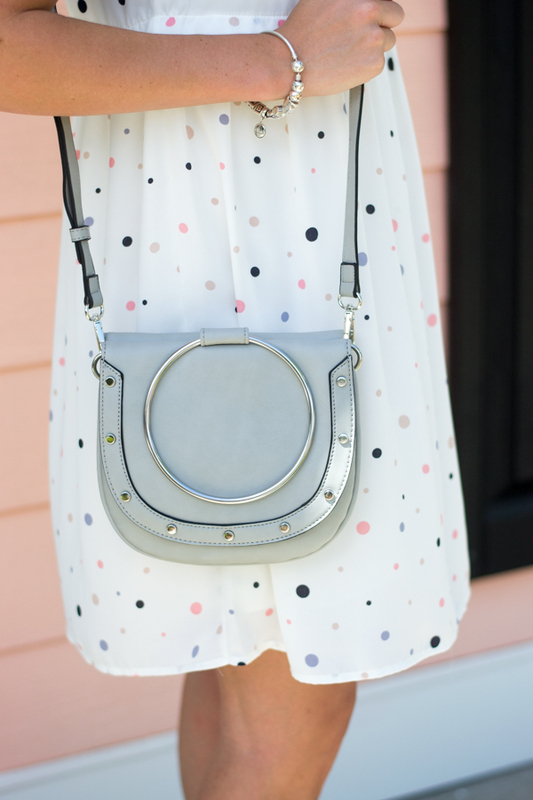 Love the cute polka dots! And that is such a good dupe. Girl, that dress is SO cute! Love! Your dress is SO adorable!! I love it! such a cute dress and i love your sandals! I am LOVING ring bags right now! I love a good bargain, and this outfit is definitely cute and affordable. I am all for Dupes, brands do not always matter to me. Awesome post, and awesome outfit inspiration. I think the shoes are my favorite part of this outfit + I LOVE white nails for the summer. Thanks for sharing! The polka dots are adorable!! And I love the cut of the dress. It's so comfy looking, yet very flattering on you. Great pick!! I've seen that purse at Target, it's so cute! Cuteee dress! Super fun and girly!